This sucker's so simple, it'll make you smack ya mama! I made this on the fly on Easter. I grilled chicken breasts and pork tenderloins outside even though it was cold. I decided that I wanted to offer something else to go along with the pork since I'd only dry rubbed it. I came up with this. 2 large navel oranges, JUICED- throw away everything else although you could throw in some of the zest if you're a real citrusy person. Melt one tablespoon of butter in a pan and add the onions. Saute over medium heat until softened and translucent. Don't brown them. Add the vinegar to the pan and stir for 2 minutes. Add the cranberries and apples. Add the cinnamon and cayenne pepper. 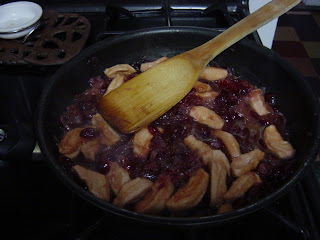 Let the mixture simmer for about another 5-10 minutes and add the remainnig 2 tablespoons of butter to the chutney. Mix well. The butter will provide a nice gloss to the sauce. Serve along with grilled meat or fish. I served it with grilled pork tenderloin which had a dry rub of sea salt, cracked black pepper, and rosemary.